There are less and less breweries across Australia who've yet to at least have a go at producing a New England style IPA and a few who look like keeping one as part of their ongoing lineup. Then there's 3 Ravens, who seem unable to go more than a few weeks without releasing another variant on theirs, the Juicy IPA that was among the first, and has become one of the most popular, of the locally brewed examples. 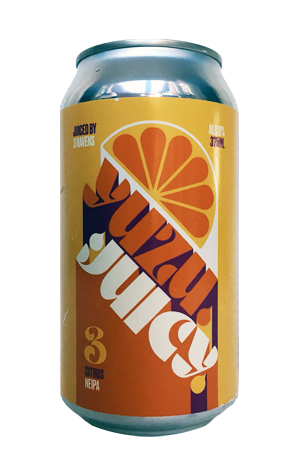 Only last month we had the least Juicy Juicy yet, their dessert like GABS entry Moussey Juicy, and now we're back in fruit territory with Yuzu Juicy, which brings locally grown zest and juice from the Japanese citrus fruit into play. And, while the beer looks pretty much like OG Juicy, the yuzu has more of an impact than the fruit in its closest cousin, Lemon Juicy, enhancing the base beer's tropical and citrus characters so you'll find mango, grapefruit and grassiness layered on thick, as if by an oil painter armed with a mop. It's smooth on the palate, with a gently rising bitterness, creating the overall impression of a fruit juice for grown-ups.